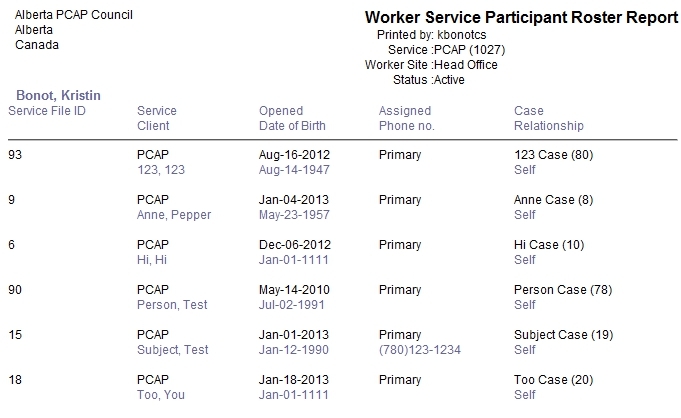 Look for the grey heading “Case Service Reports”, and then click the link for “Worker Service Participant Roster Report”. A box should appear with the title “Parameters”. Leave “Case Worker” blank, unless you want a list of a particular worker’s clients. Leave “Include Page break” unselected. From the home page, go to the right hand menu bar and click the “Reports” heading. Then click the link for “My Service Participant Roster Report”. A new window should pop-up with the report. To print the report, use “Ctrl” + “P” on your keyboard. To exit the report, click the “x” in the top right hand corner.